4. Teenagers may often act like assholes, but underneath they are insecure. (Remember… you were there, and you were a mess.) Find something truly nice to comment on. Say, “What beautiful eyelashes you have” to the girl who packs your groceries. Even if she puts the bread on the bottom. 5. Do the same for older people. Older women often pride themselves on the good taste they have acquired over a lifetime. When you are standing next to an older lady, you can usually find something that expresses the care she takes to look nice. A good purse, a pretty scarf, earrings, perfume. Notice what it is, and tell her. 6. Do you have subordinates? Don’t just tell them what to do. Tell them, “I need your help.” Say, “I’m glad you’re here.” And when they do something right, don’t say “Good.” Say “Great.” Say “Perfect!” if it is. Note: This is an audience-participation post. Please add the compliments that you like to give – or like to hear! Gee, you are a great writer and your blog has entertained me to no end. That will keep me going for another two months. Thanks. That’s a terrific idea. Or ask for the manager right then and there, and when the manager comes over, tell them (in the employee’s presence if you can) what a great job the employee did. Thanks for a great suggestion. See! I feel the same way! The smallest compliment can make my whole day. Great post. Great advice. It would make the world a little brighter. I know a couple of people whose whole lives were changed by a compliment given when in school. Thanks for this. Thanks. Mark Twain said it well. A good compliment can keep you going. It works! I’m so glad you told her. Sometimes in the grocery store, when I see an old lady buying something, I go up and ask her if she would recommend that brand. And then I thank her for her advice. Some people have a lot of knowledge and no one to give it to. Good post. I remember commenting on an elderly lady’s perfume in the supermarket queue. She was over the moon as it was new (a gift from her grand daughter) and she hadn’t tried it before. My husband can be as aggravating as any man can be, but he also makes my life easier in a thousand ways, by doing so many little things. I often take them for granted. But last week he did the simple task of changing the light over the sink, and hey, I could put my makeup on again – and I remembered to thank him. I always enjoy your posts. Great Job! Thanks. I am good for several more weeks. Right on! I this is so true. I work at a grocery store and we are asked to do that to customers and each other. It makes a huge difference. I’m re-blogging and sending to Facebook. Everyone should make the effort. We could all be making each other’s day! Thanks for the reblog. 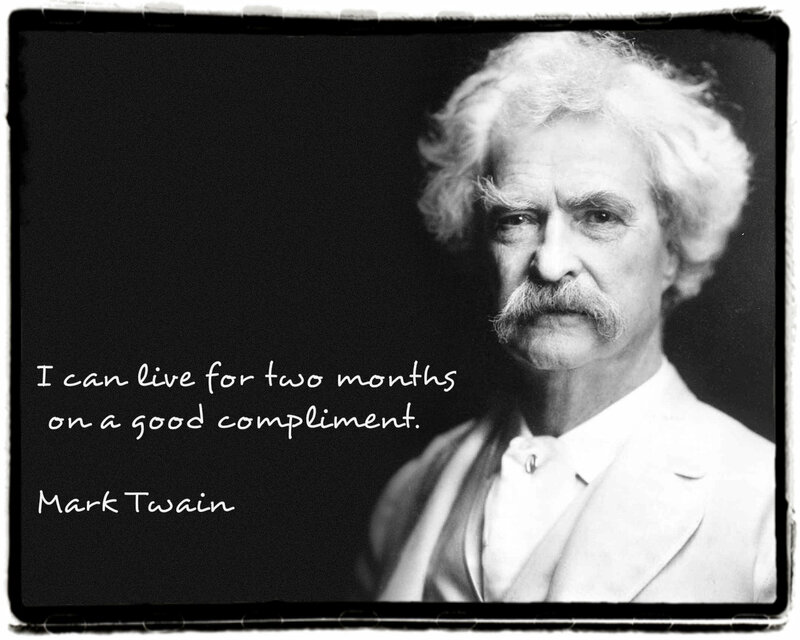 Compliments are such simple things, but they can generate so much good will. You madam, have often taught me things even within your humor. I am grateful both for the lesson and the laughter. As to compliments, I am always mindful to say thank you and to send a letter to a business when an employee has been especially helpful. I make certain I name the employee and say what and when. I am a huge fan of positive re-enforcement. This was exactly what I needed this morning to remind me that not everyone in the world is a negative Nellie. Perfect post, perfect list, on the day I most needed it. Thank you – Not perfect at all, but I have the best intentions. Great advice! If I can’t think of anything specific to compliment on or we haven’t had an interaction – I think a smile goes a long way, too. Just a smile does go a long way. Here’s something else to consider: When I used to visit my father in the nursing home, there were dozens of old people sitting in their wheelchairs in the hall. I often stopped for every person and said Hello. It took me a long time to make it down the hall, but maybe it was the only hello of the day for one of those people. Thanks. I put it into practice tonight too. I stopped to tell my Yoga teacher than his class was extra good tonight, and that he made me feel wonderful. This is wonderful advice, delivered with kindness and generating a smile. Thank you! What a fantastic idea thing to do! If you look for something to compliment, you’d be surprised how easy it to find it. I rewrote my comment, so it doesn’t make as much sense as I would have liked. Darn that editing mid-sentence! I do agree. Seeing the good in people can make the world a better place! Thank you. An inspiration! That inspires me! What, hitting “Like” isn’t enough?????? Thanks for the reminder to look for opportunities to give compliments, they can bring so much joy. I chose to be a stay-at-home mom so I often find myself encouraging moms in my neighborhood. Saying things like – “You have such an important job, or you have so much patience.” Our society doesn’t do much to support non-working moms and the job can be quite isolating. A few years ago, I did compliment a young man (about age 12) who had been sitting behind me in a restaurant. His conversation with his grandmother (I assumed) was so polite and mature. He beamed as I told his grandmother what a wonderful young man she was with and how lucky she was. She agreed and that kid almost jumped out of the booth with pride and happiness. I hope he remembers it. I try to tell people they have done a great job. It takes a little practice to make the right comments, but is worth it. There are times when I give a friend a much needed compliment, and that’s when I feel the beauty of love that giving brings. As usual, a well-written piece with great content. I have always given lots of sincere compliments and know that it brightens everyone’s day. Recently I rang a bakery and said that I had just bought a vanilla slice. You could almost hear the pause, waiting for the expected complaint. However, I said, “It was the best vanilla slice I have had in months.” Too often we only call to complain, so that makes a compliment doubly special. Try it, everyone, as Nancy suggests. I’m late seeing this post, but what great advice! Not only did you suggest that we give compliments, but you give perfect examples of how easily it can be done. Motor Man is always saying: “you don’t have to thank me”, but, as I’ve told him, I thank total strangers for doing something nice for me: I certainly should thank my husband! And I actually HAVE mentioned to parents in restaurants how well behaved their children are. You’re so right about teenagers being insecure; they need compliments more than many other folks whose paths we cross. And your “nice car” comment….. so very true! Thanks for opening our eyes to so many possibilities to brighten another person’s day! Have just found your blog and can totally relate to this post. Last week, with no Internet and no land line (line had been accidentally cut) and no cell service at my cabin, I headed into McDonalds for iced tea and Wi-Fi. As I got in line a man turned to leave and almost bumped into me. Niceties were exchanged (excuse me, no problem) and I pondered whether to indulge in that sausage cheese biscuit or save my ever expanding waistline from another indignity. What a nice compliment – and coming unexpectedly makes it that much sweeter.